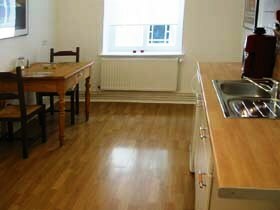 1-room apartment - It has a living/sleeping room, kitchen and shower, digital TV, access to the internet. The floors are made of timber, kitchen and bathroom are terracotta-tiled. Close to the S-Bahn (surburban railroad) Bornholmer Street and the tube-station Schoenhauser Allee. 1 - 2 persons 50,00 euro- each additional person 15,00 euro - from 1st April 2007: 1 - 2 person 55,00 euro per night . 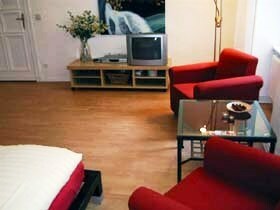 1-room apartment - It has a living/sleeping room, kitchen and shower, digital TV. The floors are made of timber, kitchen and bathroom are terracotta-tiled.Close to the S-Bahn (surburban railroad) Bornholmer Street and the tube-station Schoenhauser Allee. 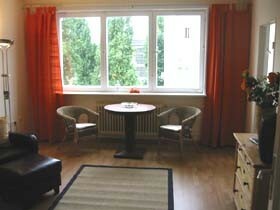 1-room apartment - It has a living/sleeping room, kitchen and shower, digital TV. The floors are made of timber, kitchen and bathroom are terracotta-tiled. Close to the S-Bahn (surburban railroad) Bornholmer Street and S-Bahn and tube-station Schoenhauser Allee. 1-room apartment - It has a living/sleeping room, kitchen and shower, digital TV. The floors are made of timber, kitchen and bathroom are terracotta-tiled. Close to the S-Bahn (surburban railroad) Bornholmer Street. 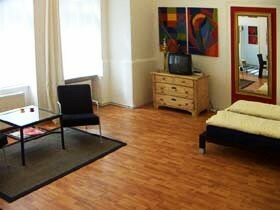 1-room apartment - It has a living/sleeping room, kitchen and shower, digital TV. The floors are made of timber, kitchen and bathroom are terracotta-tiled. Close to the S-Bahn (surburbahn-railroad) and tube-station Schoenhauser Allee. 1-room apartment - It has a living/sleeping room, kitchen and shower, digital TV. The floors are made of timber. Close to the S-Bahn (surburbahn-railroad) and tube-station Schoenhauser Allee. 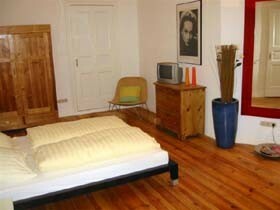 1-room apartment - It has a living/sleeping room, kitchen and shower, digital TV. The floors are made of timber. Near by the S-Bahn (surburbahn-railroad) Beusselstreet. 1 - 2 persons 50,00 euro- each additional person 15,00 euro -from 1st April 2007: 1 - 2 person 55,00 euro per night . 1-room apartment - It has a living/sleeping room, kitchen and shower, digital TV. The floors are made of timber, kitchen and bathroom are terracotta-tiled. Close to the S-Bahn (surburban railroad) Nordbahnhof and tube-station Oranienburger Street. 1 - 2 persons 55,00 euro- each additional person 15,00 euro.